The mystery of the Seven Pagodas is shrouded in dark clouds though the term and the place is known to us since the last quarter of the eighteenth century CE. Considerable research have gone into this, however, unfortunately, we cannot say anything with certainty on this matter. There are some feelers suggesting that the Seven Pagodas could be true, but these are just feelers and nothing concrete. Balbi did not visit the place, but passed through it, that too very early in the morning, about three o’clock. How much he could have seen at that time in the morning, with considerable mist around, is questionable. However, he knew that the place was known as Seven Pagodas and it can inferred that he came to know this term through other mariners. The next reference is from Alexander Hamilton2, in 1744. He only mentions the name Seven Pagodas but no explanation on the term. Pierre Sonnerat3 was the next to mention Seven Pagodas stating that the temples called by this name would be the oldest on the Coromandel coast, however he also skipped the reason behind this name. From the above account, we infer that there were two notions of the Seven Pagodas. 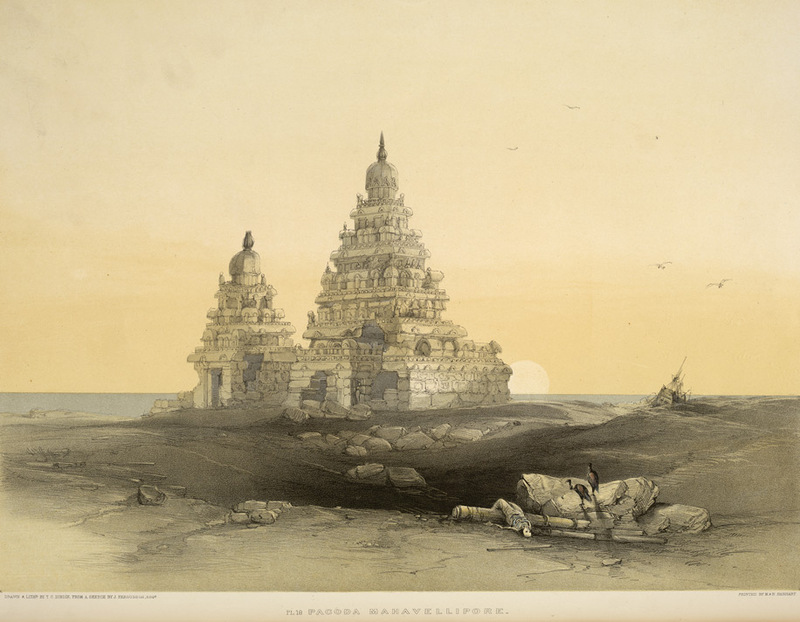 The first notion was that the hill at Mamallapuram with its various excavations was part of Seven Pagodas and the other notion was that the Shore Temple with its submerged cousins constituted Seven Pagodas. The notion of the hill was rejected by Chambers based upon the reason that the hill does not assume such appearance. He brought out the theory of submerged temples to suggest that it was Shore Temple and its cousins which would have resulted with the name of Seven Pagodas. Two interesting things to note here are, that the natives who narrated the story of submerged temple tops did not tell how many temple tops they were able to see. Another fact is that the name Seven Pagodas was provided by mariners, but the number seven should be taken in its absolute value or it was just a notional number. 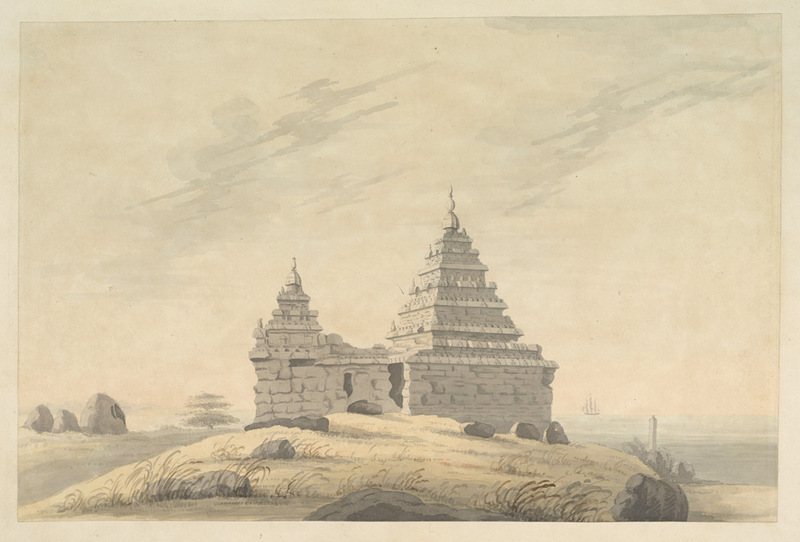 Haafner and Chamber visited Mamallapuram in the same decade, Chambers in 1772 & 1776 and Haafner between 1779 and 1781. Isn’t it surprising that they gave two different accounts on the submerged temples? Chambers clearly tells that only the Shore Temple, as in its current form, was the only surviving temple out of the seven pagodas. While Haafner says that he could see all the seven temples, like a reef of rocks, deep into the sea. Probably the clue lies in the words of Haafner. Why did he used the term ‘like a reef of rock’, instead of using seven distinct structures. Did he see a reef in the deep sea which he took as the remains of the seven temples? Interesting to note that the native acquaintance of Goldingham mentions about five submerged pagodas, suggesting that the two towers of the Shore Temple was all left of the Seven Pagodas. We should take into cognizance that all these accounts from the natives, as told to Chambers and Goldingham, were from the memories or as told by their ancestors. None of those natives saw the submerged tops by their own eyes. In such circumstances, account from Haafner is really curious and surprising. Aftre Goldingham, the quest of the Seven Pagodas took a halt as the scholars got busy with the trifling monuments at the site, their dates, authors and other architectural features. Before we move to some recent researches in this area, lets give a thought on how Mamallapuram was during and before the Pallava period. Of course, we do not have concrete information on this aspect, however there are certain literary sources which can help us understand the picture of that time. Dandin, in his Avantisundari, mentioned that he visited Mahamallapuram to see a recumbent Vishnu image. He did not mention any other temple at the place, and also did not tell that there were Shiva temples on front or back of the Vishnu image, as we see the complex today. He also mentions that the sea waves used to splash over the Vishnu image. Assuming that the Vishnu image mentioned by Dandin is the same Vishnu image as of in the Shore Temple, then this suggests that during the time of Dandin, 8th century CE, the Shore Temple did not exist. Also, there were no such seven temples at that point of time. It is an accepted fact that it was Rajasimha who built the twin temples of the Shore Temple complex. He has been attributed to few other monuments at the same site and as well as Kancheepuram and few other places. Would it be possible for him to build seven such temples at the same site during his rule? Rajasimha rules for about 30 years or less, and he was an avid temple lover pushing all limits and money on temples. However, constructing seven temples, on the same scale as of the Shore Temple, is not an easy task even for a royalty within a short time span. But why to think that it would have been carried out only during the reign of Rajasimha, there is a possibility that the construction activities were continued by the later rulers. The Pallavas were routed by the start of the tenth century CE and this would be the latest time to which we can push the seven pagodas. Now, if there were seven such temples, it would certainly be a magnificent achievement and should find at least a cursory mention in the epigraphs of the later rulers. Unfortunately, this is not the case, though we do find references of other temples in later epigraphs but not of the complex of the seven pagodas. In such a situation, the seven pagodas theory look very dicey. In April 2002, a join underwater exploration, for three days, was carried out by the Scientific Exploration Society, UK and National Institute of Oceanography (NIO), Goa.8 This exercise provided clues on possibilities of man-made structures off Mahabalipuram. Therefore a bigger joint exercise was planned for 2003. However this joint exercise could not be realized, and NIO alone carried out this mandate in March 2003. On the dating of these structures, NIO report mentions, ‘In the absence of datable evidences, the structures found underwater can be dated only based on the local traditions and available literature.’9 The structures are dates around 1500 BP. From the above, it is clear that there are some structures submerged near the shoreline, however there exact nature cannot be determined with certainty though it may be said that these might be remains of some temple of similar size as that of the Shore Temple. But what would have caused this submergence? The sea level fluctuations on the Indian east coast have been documented for last 5000 years.10 It seems that there has been no major tectonic activity at this sea coast in last 1200 years.11 In such a case, the best guess would be coastal erosion. But erosion is usually a slow process, how much time would it take to submerge five temples? It is suggested that the rate of erosion at Mamallapuram coast is 55cm/yr.12 If we apply this rate, for 1500 years, as the date of the submerged structures, we get a figure of 825m. This means, that the structure which in now lying deep in the sea would be above ground some 1500 years back. Based upon the above NIO report, during 1770s, the shoreline would have extended to an extra 130m into the sea. Does this allow the tops of the temple to remain visible above the sea? Can five temples be accommodated within 130m as claimed by Haafner to be visible by his time? How about the natives of Mamallapuram, ancestors of whom narrated the stories of seeing gilt tops, how true it would be in such a case of slow erosion? 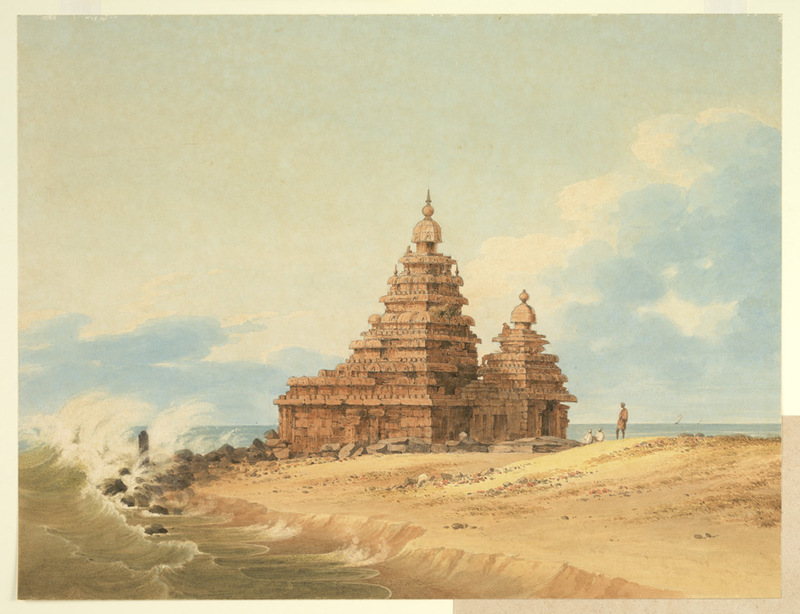 2004 Indian Ocean earthquake and tsunami provided an opportunity for archaeologists to carry out further discoveries as when the waves engulfing Mamallapuram receded, they also washed away beach sand into the sea, exposing remains of various structures. ASI (Archaeological Survey of India) carried out excavations at two sites, one site at about 300m south of the Shore Temple and another site at Saluvankuppam. The site near the Shore Temple was excavated under T Satyamurthy, Superintending Archaeologist at ASI Chennai circle15. The excavation exposed a massive temple complex, larger than that of Shore Temple. Satyamurthy believes in the legend of Seven Pagodas and tells that this excavation will pave the way forward for further investigations in this direction. The site at Saluvankuppam unearthed remains of a brick basement, where three different phases of construction were observed.14 These different phases were dated to early 4th century CE, 6th -8th century CE and 8th – 9th century CE. It appears that the sea had encroached this structure multiple times which resulted in different construction phases. Conclusion – We have seen above that during the time of the Pallavas, there was no reference to the magnificent seven temple complex, not in inscriptions and not in literature. Though it is not mandatory or customary to the Pallava kings to insert such a reference, however absence of it is also surprising. The tern Seven Pagodas came from the early mariners, how they get to know it, whether there were exactly seven pagodas or its just a notional number, did any mariner visit the town or they just passed through it during their journeys, are all open questions at the moment. The marine archaeology has opened new avenues and provided some early feelers of submerged structure. However in absence of concrete or clinching evidences, nothing can be said with any certainty. There is a scope for further research, however it would be a very costly affair. Except Haafner, no other traveler mentioned seeing the seven structures. In such a situation, account from Haafner appears questionable. All the early sketching and photographs go against Haafner. And Haafner did not leave any sketching of what he saw on the shore. The quest is open and the question is unresolved. In my opinion, there would of course some structures submerged near the sea shore, as also found at many other ancient ports on the east coast of India. It would be tough to associate these structures with the Seven Pagodas, and at the present moment, the theory of Seven Pagodas seem to be a myth. 14 Rajendran C P, Rajendran Kusala, Machado Terry, Satyamurthy T, Aravazhi P & Jaiswal Manoj. Evidence of ancient sea surges at the Mamallapuram coast of India and implications for previous Indian Ocean tsunami events. Current Science vol. 91, no 9, 10 November 2006.